I've recently acquired a GA-Z97X-SOC and i7 4790k combo to upgrade my existing setup and regardless of overclock settings; if I leave the PC off for about 15 minutes I have to re-seat (e.g take one stick out, boot, place stick back, reboot) the memory in order to be able to boot back up without it becoming stuck in a bootloop displaying code 32 before powering off and back on infinitely. I've tried clearing CMOS, switching bios, resetting to default settings, powering off for an hour with cmos battery removed, holding cmos reset down after adding battery back etc etc. Can anyone shed some light on this? The rest of the hardware, other than mobo and cpu came straight from my fully functional previous setup. I can boot and use the PC using the RAM reset method but it's beginning to get a bit tedious. Your issue is likely the memory since it runs with 4 sticks installed with the work around your described. Are they all detected in the OS (16GB). What does the BIOS show? F6 is minimum required for 4970K. Code 32 is CPU PEI Initialization. Sounds like you have this rev or later. The only 4GB Geil memory known to be supported by your board is Value and Potenza. Black Dragon is not on the QVL. I realize it shares the same CAS latency 9-9-9-24 and voltage 1.5v, but the BIOS may not support JDEC/XMP profiles of the RAM. If you are trying to over clock, stop and attempt to attain stability first. You might have to set latency and voltage manually in M.I.T., and even this might not work. Will the system boot consistently with two sticks installed? Inserted into DDR3_1 & DDR3_2 Yes/No? 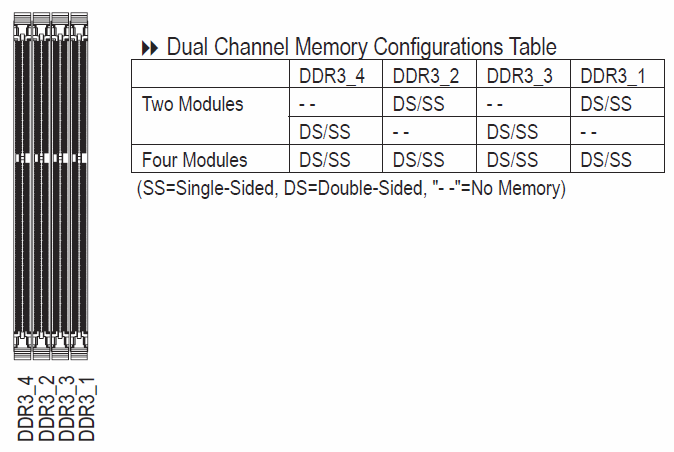 What about one stick in DDR3_1. If setting memory values manually doesn't resolve, I would suggest buying RAM on the QVL for your board. Thanks for your detailed reply, I managed to eventually solve the issue entirely by flashing the f6 BIOS instead of the newer f7, boots perfectly now for god knows what reason. Oh well, at least I can stop pulling out my hair. Good work! Always happy when a problem has a positive ending. I'm afraid I am back, this time with another issue. When I first boot the PC it runs fine for about 5 minutes, suddenly shuts off and powers back on saying that boot has failed, if I then continue again to the OS without changing anything it runs perfectly until the next time it is powered off fully and left for more than 15 minutes. Should I just give up on this motherboard at this point? I have problems with another Gigabyte board as well, I think I'll steer clear for my future purchases. Don't throw in the towel just yet. Does this happen when you are actively using the machine at 10:16, or only when its been idle? Windows 7 or 10? Also, are you using ErP setting? If yes, disable it. This behavior is often related to power management. Try disabling Fast Start Up in Power Options. Then restart and wait the 10:16.. If it happens again when idle, a piece of hardware you have installed or driver might be to blame, but the first place to look is Fast Start up. If it happens when you are using the machine and disabling Fast Start Up doesn't help, I'd reset and reflash the BIOS to same version, then perform another reset and set up from scratch. No need to mimic my power settings, I'm on a laptop ATM.. just change the Fast Start Up option. Thanks for you continued help @shadowsports it is much appreciated. I managed to find a workaround in the end, if I press the power button, wait for USB initialisation and then press the restart button it works perfectly after that. Still no clue why it is happening but at least I can stop tearing my hair out in frustration.